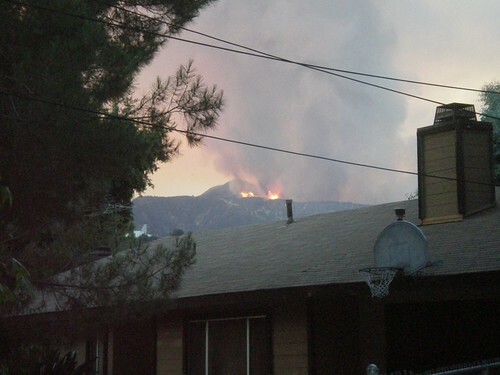 That’s the view of one edge of the Station Fire currently burning above La Canada, as seen from my next door neighbor’s front yard. A few more pics are up on my flickr. We are eating iceberg wedges with blue cheese dressing for dinner. When stressed, the classics appeal. You’d better believe my knitting is packed and ready to be loaded in the car. Wow! That is close! I hope you and yours don’t have to evacuate. I’m hoping it either rains or gets very damp in the next few hours! Take care and be safe! Ugh. I hope the Santa Anas don’t start blowing and if they are currently blowing, I hope they STOP. Holy moly! In Burbank, we’ve got orangey sky and a lot of smoke.